A genome-wide approach to genetic engineering greatly speeds the manufacture of bacteria for making drugs and biofuels. 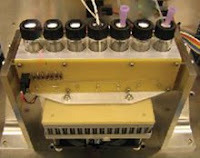 Better bugs: Using a specially designed machine (shown here), scientists can rapidly engineer up to 50 genetic changes in bacteria, dramatically speeding the quest to design bacterial factories capable of efficiently producing drugs, biofuels, and other chemical products. Rather than changing the genome letter by letter, as most genetic engineering is done, George Church and his colleagues have developed a new technology that can make 50 changes to a bacterial genome nearly simultaneously--an advance that could be used to greatly speed the creation of bacteria that are better at producing drugs, nutrients, or biofuels. "What once took months now takes days," says Stephen del Cardayré, vice president of research and development at LS9, a biofuels company based in South San Francisco of which Church is a founder. LS9 soon plans to use the technology--called multiplex-automated genomic engineering, or MAGE--to accelerate development of bacterial cells that can produce low-cost renewable fuels and chemicals. In the traditional stepwise approach to genetic engineering, scientists tinker gene by gene with a cell's metabolic system, attempting to rev up some reactions and dampen others. But this method is slow and unpredictable. A cell's metabolism consists of millions of intricately intertwined reactions, so making a specific change to a gene involved in one reaction may not produce the desired outcome, or may trigger harmful side effects.